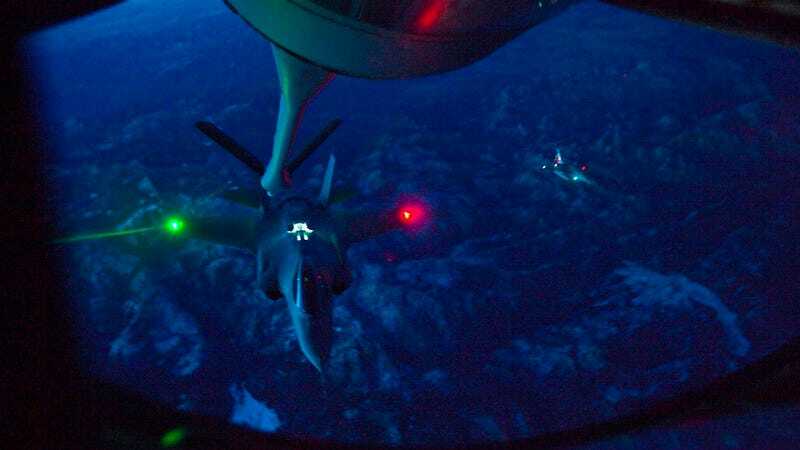 If it's going to cost us a trillion dollars and not do much, then let's at least be glad the F-35 makes for some pretty photo ops: here it is on its very first night refueling mission, glowing like it's flying over the moon. What are we seeing here, exactly? What's that tentacle space probe? A fuel boom: the F-35 hooked up with an "Air Force KC-135 tanker and successfully received fuel through the F-35's boom receptacle," a sensitive piece of flying. So thanks, trillion dollar plane. You photograph so good.